Bay Coal Terminal (RBCT) is a world class coal export terminal situated in the Port of Richards Bay. The terminal was opened in 1976 with an original capacity of 12-million tons per annum (mt/a). The terminal provides South Africa's Coal Exporting Parties (CEPs) with a world-class logistics service that facilitates the export of coal. RBCT is positioned at one of the world's deep-sea ports and handles large ships and large volumes of coal. 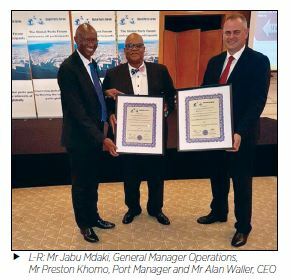 The 276-hectare site currently boasts a quay that is 2.2km long with six berths and four ship loaders, with a stockyard capacity of 8.2-million tons. All RBCT's operations and administrative functions are conducted in Richards Bay. On 23 December 2017, RBCT achieved a significant milestone in safety performance when two-million- LTI-free man-hours were recorded. We are exceptionally proud of this significant safety achievement and attribute it to our continued pursuit of the goal of a safe workplace. This milestone was achieved at a time when RBCT commissioned two shiploaders, a massive machine project. Achieving this milestone is testament to a proactive safety culture that prevails in our work environment. This achievement is a combination of our collaborative safety efforts; it specifically points to the genuine care the employees and contractors have for each other. hazard identification, risk assessments and an overall interaction amongst the workforce on safety issues. RBCT's diligence in upholding safety standards. The tonnage received in 2017 increased from 72.58Mt in 2016 to 75.60Mt (4% higher). The 2017 tonnage is the highest tonnage delivered by Transnet Freight Rail (TFR) within a calendar year. The Train Turnaround Time (TTT) was four hours three minutes in 2017 against the RBCT internal target of three hours 54 minutes. TTT is a value-chain contracted duration for offloading and handing back of trains to TFR. The value chain TTT is reflected in the signed Service Level Agreement between RBCT and TFR and the target is an average of four hours 18 minutes. The figure for trains that were tipped and bypassed directly to the vessels was 19% in 2017 compared to 17% in 2016. We continue to be aligned with our business partner, TFR, to ensure the supply chain performs well and contributes to increasing volumes. 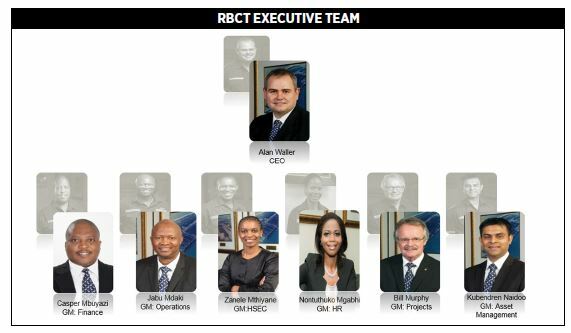 RBCT was nominated for six Zululand Chamber of Commerce and Industry awards. RBCT won five awards and was a runner-up in the sixth category. The significance of these awards is that they were awarded in areas that matter the most to RBCT, people, safety, environment and logistics. Our slogan, "Coal to the world, growth to the nation" depicts our sustainable commitment to community development over the years. Our aim is to participate in programmes that benefit the wider community and sustainable projects that can build a better South Africa. In 2017 we recognised the need to focus on early childhood development, education and environment. Due to the water shortages we faced, we regarded this as an integral component in building a better future and life for all. In 2017, a total of R3.2-million was invested in Community Social Investment (CSI) projects. Richards Bay Coal Terminal - Coal deliveries and exports at RBCT exceeds 70 million mark!